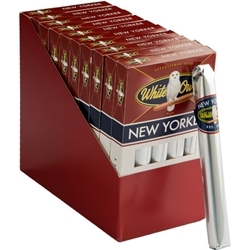 White Owl New Yorker cigars are known for offering a heady aroma and taste, infused with exotic tobaccos from 5 different countries, these cigars are sure to give you an extraordinary smoking experience. Each cigar filler is enfolded in a homogenized binder and wrapper sheet which together orchestrate a slow, measured burn. Available here at Smokers Discounts!